Phantoms have released one forward and handed a roster place to another for the rest of the season. The city club have parted company with summer signing Sam Towner two-thirds of the way through his first campaign at Planet Ice. Towner managed only 16 points (seven goals and nine assists) in 33 appearances for Phantoms. He also missed several games with concussion earlier in the campaign. Coach Slava Koulikov has a wealth of forward options following the recent capture of Edgars Bebris and the return of Will Weldon from injury. Marc Levers is also scheduled to be back during February after a hernia operation and Brad Moore is stepping up full-time from Islanders after impressing in a handful of recent outings. Koulikov said: “Sam had a slow start to the year, but that can happen when it is someone’s first time playing away from home. “The injury came at a bad time and it took him four or five weeks to get back onto the ice. A blow to the head can affect confidence, but that has returned in recent games. While Phantoms have a rich array of attacking talent, they continue to be short of bodies defensively. Scott Robson remains sidelined with concussion while fellow blue-liner, Callum Medcalf, is also out after receiving an ugly hit to the head from Hull import Martin Ondrej last Saturday. Ben Russell, who recently had a spell out with concussion, is also a doubt after stitting out the final period and overtime in the EPL Cup clash at Telford last Sunday. Third-placed Phantoms have a crucial weekend ahead with clashes against the teams directly above and below them in the English Premier League standings. They go to big rivals, and EPL Cup final opponents, Milton Keynes for a derby clash on Saturday (7pm) before hosting outgoing champions Basingstoke at Planet Ice on Sunday, 5.30pm. “It doesn’t get much tougher at this level than games against MK and Basingstoke in the same weekend,” added Koulikov. 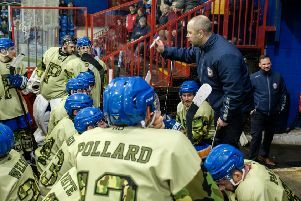 “We have a tough run with Telford and Guildford to come the following weekend as well.